RxFiles was one of the first apps Push Interactions built way back in 2011 and has remained one of several very successful apps in our portfolio. 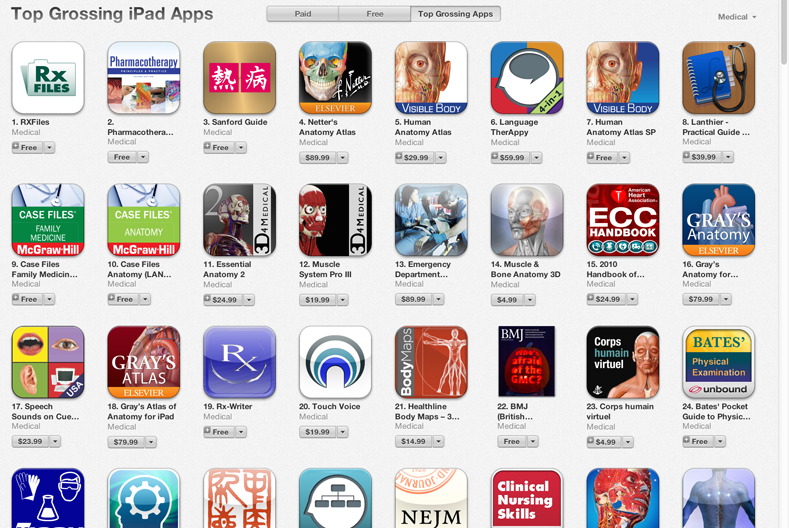 Since its first release, RxFiles has continuously been in the Top Grossing Medical Apps category for both iPhone and iPad apps. The app has remained a top seller for so many years because it provides key clinical information that is needed by doctors and pharmacists to properly dispense information and medications to their patients. It is also one of the few places that this information is available in one place, both online or in print. This vital health information is what has caused the app to stay relevant all these years and also led us to cover it in our Five Things that Make an App Successful article. How did we improve on this long running success story? By adding even more. Now when users sign up for the RxFiles subscription, which needs to be done through the website, they get access to a much wider variety of content than is delivered through the app itself. The subscription also gives users access to other publications similar to RxFiles, offering additional medical information to inform key health decisions. By using the Plus app instead of the original users are getting a lot more information and value out of their subscription. Of course, the same quality app and all the quality content that has made RxFiles one of the top grossing apps on the store for many years is still present in RxFiles Plus, so users are getting a lot more without sacrificing any features or content. We think RxFiles Plus will also be very successful on the app store with many doctors, pharmacists and nurses using it.